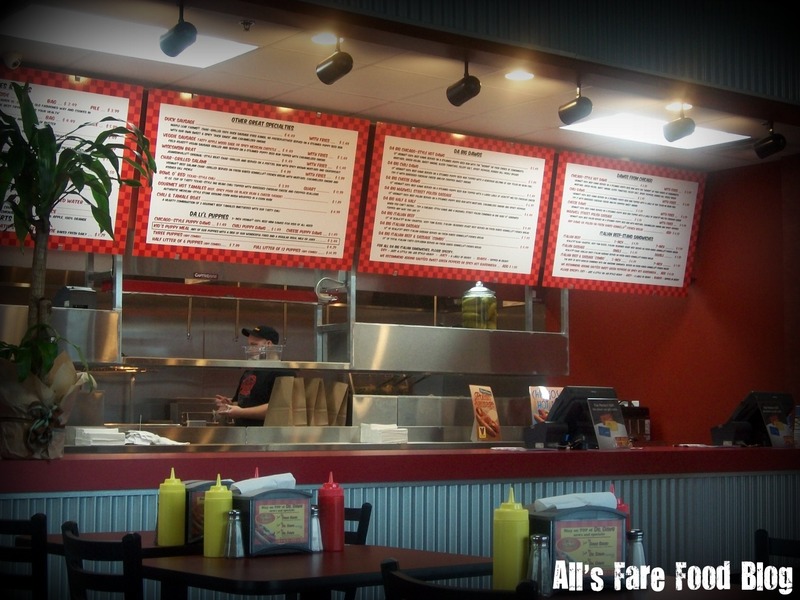 Dr. Dawg, a hot dog/fast food restaurant, has opened a second location in Glendale, Wis. Owner David Ross already has a popular location in Manitowoc, Wis., but this new location on N. Port Washington Road brings a slice of Chicago to Milwaukee’s North Shore. I grew up in Chicago during the era of the explosion of the Hot Dog industry. After serving in the Marines in the mid-sixties, I started my first business of towing cars. This gave me the incredible opportunity of learning the whole city/suburbs of Chicago and also experiencing all the great Hot Dog stands along the way. I found that I became particularly aware of every nuance and detail that separated the good from the really great stands. I was immersed in the Hot Dog culture and now consider myself an aficionado and connoisseur of the Chicago style Hot Dog. …Now, finally, after all these years, I’m proud to fulfill my dream. I am passionate about Hot Dogs and look forward to sharing this wonderful experience with you. While driving recently on I-43 with my husband, I saw a huge sign saying “Dr. Dawg is now open.” Since my husband works nearby and needed to pop into the office, we decided to try the doctor’s dogs. 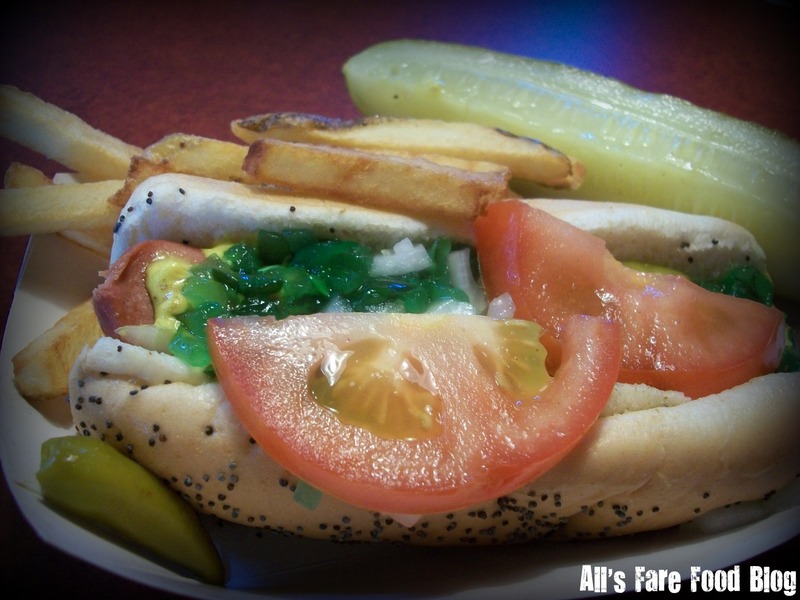 Dr. Dawg serves up Vienna 100 percent beef hot dogs in several styles including Chicago, chili and cheese. You can also get a polish sassage (love the spelling! ), Italian beef, duck sausage, veggie sausage (apple wood sage or spicy Mexican chipotle), brat, chili, tamales and more. There’s also Da Li’l Puppies, 3-inch Vienna hot dogs for kids of all ages. You can order three, a half litter (six), or a full litter (12). Side includes hand-cut french fries, cheese fries, chili cheese fries and garlic-rosemary fries. 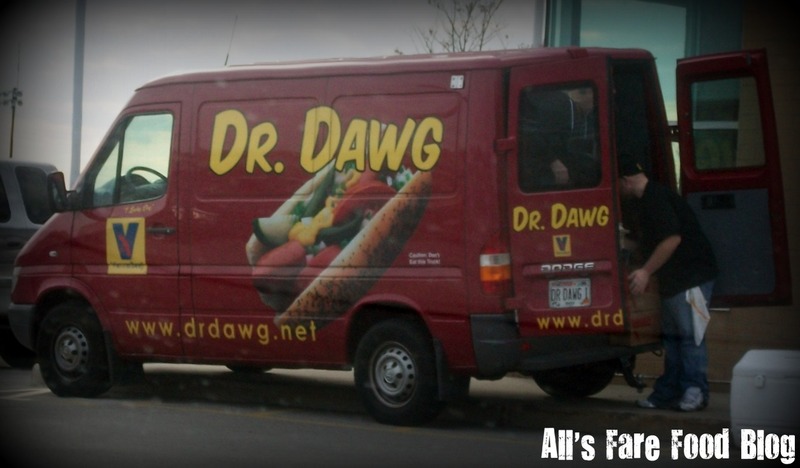 Download the full menu for Dr. Dawg. It was hard to decide between the Chicago-style dog or the Italian beef. But we finally made our minds up. The doctor was in to take our order, too. While checking on things in the front and back of the restaurant, he also checked with guests to see if their meals were OK, met with a vendor to check that newly-installed benches were completed properly and spied his Smartphone between sips of water. Dr. Dawg is located in a little strip mall that also has a Stone Creek Coffee, sushi restaurant and Pick ‘n Save grocery store. The restaurant seats a fair amount of people at tables or booths. The decor is clean in reds, whites and blacks. The kitchen is clearly visible from behind the cash registers. 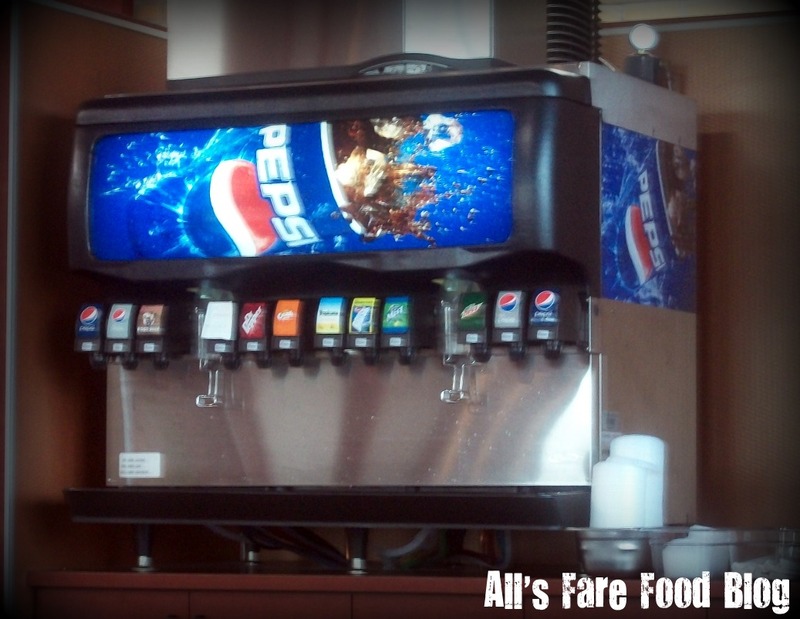 Free refills of Pepsi products and Lipton iced tea, lemonade and yes – Sprecher Root Beer! Score! You can also get bottled water, milk and juice. The hot dogs are great. The Vienna beef dogs have a robust flavor. The casings have a nice crunch. The steamed poppy-seed buns are moist yet they stand up to the garden of ingredients inside. I have issues with some other hot dog places in the area whose buns fall apart three-quarters in and I’m left with a huge mess. The pickle spear is more of a dagger. I’d have to say the quality of food at Dr. Dawg is top notch. I can’t wait to go back and try the Italian beef or the Italian beef and sausage combo. I just wanted to get a picture of the van with a huge hot dog on it. Not the Weinermobile, but still pretty cool. Dr. Dawg also does catering so if you crave some doggies for a picnic, work gathering or family party, they can create a custom feast for your event. 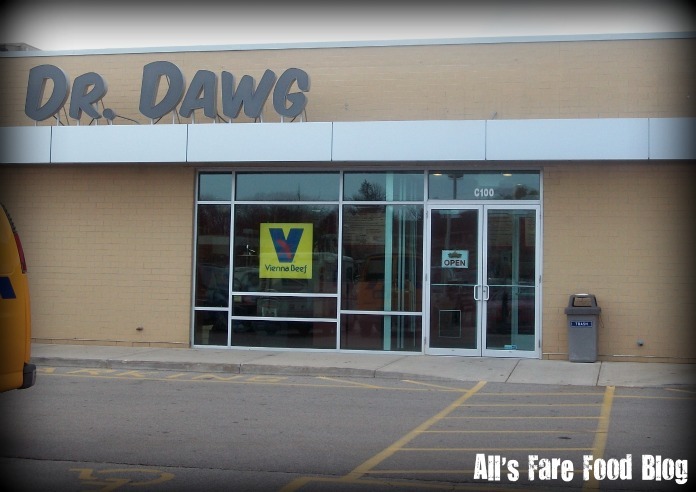 Find out more about Dr. Dawg at www.drdawg.net or visit them at 6969 N. Port Washington Road in The Glendale Market shopping center. This entry was posted in Cuisine - American, Places - Milwaukee and tagged Chicago, chili, David Ross, Dr. Dawg, fries, Glendale, hot dog, Italian beef, Manitowoc, Milwaukee, North Shore, Port Washington Road, puppy dawg, Sprecher Root beef, veggie sausage by Christina. Bookmark the permalink. Thanks for reviewing Dr. Dawg! Henry absolutely loves Hot Dogs. I can’t wait to take him. It’s also a great addition to Glendale. Although, we have restaurants at Bayshore Mall and a few other local eateries it’s nice to have more options to eat out! I’m sure Henry will love the “puppy” size hot dogs. If you get a photo let me know and I can post! Finally a real hot dog joint and not another wannabe. (Martinos) A hot dog with a casing. A grilled polish, not deep fried. And the best of all, Scala’s Italian Beef. Vienna is known for many things but there italian beef is average at best. Scala’s is clearly the best beef. Right up there with Johnny’s and Portillos. So now I only have to drive 16 miles instead of 65 to Skokie for Poochies for a hot dog. And they have the grilled salami sliced in a slab. Can’t wait to try it next. Thanks for stopping by Marc! The fries are Awesome! I’ll have to try the tamales the next time I’m back in Milwaukee.